The new wave of digital advertising is here and some may say it uses deceptive practices and camouflage. Native advertising is a way for brands to create content in the same style of the website it appears on. For instance, a native ad placed on the New York Times website will have a headline and summary like any news article but it will be labeled as a "Paid Post." Those in the marketing and publishing world are experimenting with new forms of native ads while it's still in the infancy stage, but readers and consumers in a handful of studies are not hopping on board so easily. In a study conducted by the agency Contenty, two-thirds of those surveyed said they felt deceived upon finding that an article or video was actually paid content placed by a brand. Is this the new age or digital advertising? Will this create a more aware audience or are consumers being duped? Find out as we discuss with Chicago Sun-Times publisher and editor-in-chief Jim Kirk, Al Gini, professor of business ethics and chair of the Department of Management in the School of Business Administration at Loyola University Chicago, and Matt Witt, director of digital integration at the Chicago marketing agency Trisect. Read an interview with Michael Sebastian, media reporter at Ad Age. Q: What is native advertising? It is a marketing tactic where ads are meant to mimic the editorial content surrounding it, and inherent in that, more or less, is some confusion over what’s and an ad and what’s editorial content. Q: How long has native advertising been around? Arguably, it’s been around since there were advertorials in newspapers or magazines, or since there were soap operas on TV or the radio; they essentially integrated products into the show. Really, over the last few years the term native advertising has taken root, and it’s really focused on digital media because that’s where it’s being sold. Q: What are some examples of native advertising? The big example within the last couple of years that got a lot of media attention was when The Atlantic ran a post from Scientology that looked like an editorial article on its website, and [The Atlantic] took a lot of flak for that, took it down, and apologized for it. And they ended up amending their rules for it. Since then, every media outlet for the most part has adopted this tactic. Q: Has native advertising been used on social media? There’s a distinction there. I think that they refer to it as sponsored posts in many cases. But almost by its very nature, native advertising exists in stream. It’s not off the right or the top of the page. It’s literally within the stream of content as you’re scrolling through. Q: How is native advertising similar to and different from an advertorial? I think that more likely than not for the advertorials publishers went to great effort to indicate those advertorials were marketing and marked as an ad. 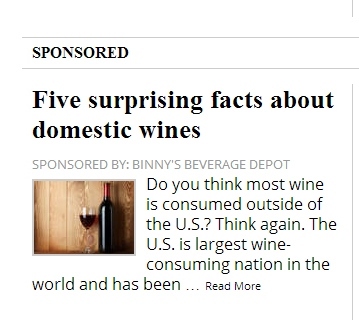 They were probably in a different font or color, or [publishers] set them apart from editorial content, and today, you know there are publishers that toy with the way they label these ads. Sometimes, they’re labeled as sponsored posts or brand posts. There’s no single way of labeling. The more ambiguous the label; the easier it is for the consumer to mistake native advertising for editorial content. In a lot of cases too, these companies aren’t making native advertising have different fonts or colors. They’re trying to make them blend in with the regular editorial content. Q: Is native advertising successful or effective? It’s still the early days in a lot of this stuff. The click-through rates are higher than banner ads, considerably higher. That’s one sign that native advertising seems to be working, if the measurement is if people are clicking on them. Publishers are able to charge more money for [native advertising] in more cases, which is a win for publishers. Native advertising also requires more time and effort on their part. They have to be able to balance that with charging more and devoting more resources and time to creating [the ads]. Brands don’t tie native advertising to selling products; it’s more awareness play. It’s part of a longer approach to sales. Lots of B2Bs use native advertising; G.E. uses it as part of its sales function. Lots of consumer brands do, too. Look on Buzzfeed, and you’ll see HBO or Purnia Cat food that are working with Buzzfeed to create these really viral lift stories that are native ads. Q: What do you see as the future for digital advertising? Some of the ads, display ads you see on websites are increasingly sold using technology; machines talking to machines, cutting out the ad salesman, reducing [a company’s] sales force. That’s bad for publishers. It’s good for the company buying ads. In order to combat that, publishers have put an emphasis in native advertising, sponsored content—those two terms mean the same thing because those ads become less commodified. A sales person has to work with a brand to create a larger program to work from, one in which the middle men aren’t cut out, and have a human touch point with. There’s literally billions flowing into native advertising markets. That number is expected to increase for the next five years at least. Q: Is native advertising the future of digital advertising?